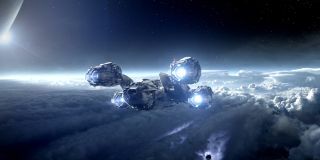 The titular spaceship of "Prometheus" makes its way to a distant planet. Opening date: June 8, 2012. LONDON - After years of fantastic rumors, intense secrecy, and widespread speculation, Ridley Scott's "Prometheus" made its London premiere this week, and the cast and creators of the terrifying science-fiction film were on hand to usher it into theaters. Originally framed as a prequel to Scott's franchise-starting 1979 film "Alien," over time the film evolved into something far more complex than a simple prologue. After "Lost" co-creator Damon Lindelof was brought on to expand the original script authored by Jon Spaihts, "Prometheus" eventually became the film it is now: a standalone sci-fi story that clearly unfolds within the Alien universe, but explores such heady themes as the origins of life and the nature of humanity. "For me, the issue with the word 'prequel' is that you know how it's going to end: it's going to end at the beginning [of the rest of the franchise]," Lindelof told SPACE.com and sister site Newsarama during the blue-carpet premiere of "Prometheus" in London's Leicester Square. "So I said, if we're going to revisit the Alien universe, that's cool, but the end of the movie shouldn't be the original 'Alien,' this movie should go off in its own direction. If there's a sequel to 'Prometheus,' it wouldn't be 'Alien.'" Ridley Scott directs Noomi Rapace on the set of "Prometheus." Opening date: June 8, 2012. "[Ridley] likes strength," said Rapace, who plays scientist Elizabeth Shaw in the film. "He's not afraid of strong women and men around him. He likes ideas and he likes to be challenged, and he's very passionate. It was amazing to be on board this journey with him." Rapace's sentiments were echoed by co-star Charlize Theron ("Snow White and the Huntsman"), who plays the cold-hearted leader of the expedition, Meredith Vickers. "I want to work with filmmakers who inspire me, and [Ridley] is one of those filmmakers," she told SPACE.com. "I like his films, I like what he does, and I feel so lucky to be at a place in my career that I can hold out to work with people like that." Surprisingly, despite all of the trailers and preview footage released in the run-up to the film's premiere — including some remarkably clever viral videos featuring the cast — "Prometheus" still manages to save many of its biggest surprises for the film itself. According to actor Logan Marshall-Green, who plays opposite Rapace as Elizabeth Shaw's scientific colleague and lover, the secrecy surrounding the film was as much for the audience's sake as for the studio's professional interests. "I think we just want to keep it secret for you guys," he laughed. "It's not because it's contractual. We just knew we had something special here, and the best way to keep something special is to keep it secret." Naturally, all of that secrecy surrounding the project spawned quite a few wild rumors over the last few years, and the "Prometheus" co-writers were happy to share a laugh about some of their favorite pieces of off-base speculation that crossed their desks. Aboard an alien vessel, David (Michael Fassbender) makes a discovery that could have world-changing consequences in "Prometheus." Opening date: June 8, 2012. For Spaihts, a fake screenplay that bore his name and was circulating online for a while prompted "many emails" that made him chuckle — mostly because it was "120 pages of pure nonsense." "I think my favorite rumor was that this was actually a secret "Blade Runner" prequel, or a crossover," laughed Lindelof. "[And] that Michael Fassbender was not playing an android, but a Replicant. That would be the sweet spot, that this would be the super-prequel — and not just a prequel to 'Alien,' [but] a prequel to 'Blade Runner.' But it's not." What the film is, though, is a story that occupies its own corner of the universe established by the other Alien movies, and offers a number of spin-off possibilities — one of which just happens to be the events of "Alien" and its sequels. "If we're fortunate enough to make more 'Prometheus' films, you could make ten, and not link up with the Alien franchise, or you could do as Ridley's suggested and make two more," explained Michael Ellenberg, one of the executive producers on the film. "From the beginning, what Ridley was passionate about was not making a prequel that would tell you who Ellen Ripley's mom was, or how exactly that ship got there, that was never what he was interested in. He was interested in much larger questions about the nature of life itself, who we are, how we got here, and what he saw was a larger idea in the franchise that had never been explored: who would make such a horrible creature and why? And in looking at that creature, it came to look at the origins of ourselves." At the premiere screening, 20th Century Fox CEO Tom Rothman introduced the "Prometheus" director to a packed theater, and described the film as a project "33 years in the making." While Scott kept his own pre-screening speech short, if the screams, gasps, and outbursts of applause during the two hours that followed are any indication, there's good reason to believe we might not have to wait another three decades to find out where the sequel takes us.